If you have been to your doctor for a physical anytime in the last couple years, you were probably asked if you smoke or use drugs and alcohol. Physician screenings have become quite common in the wake of the prescription opioid crisis, determining if there is a problem helps doctors decide if a prescription should be written. If it appears that someone is struggling with substance abuse, it is a perfect opportunity to talk with the patient and recommend counseling or treatment. While answering questions from doctors about substance use may not be that surprising, you may be confused when you dentist asks you about drug use. 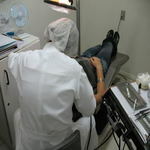 New research suggests that more than 3 out of 4 dentists ask their patients about illicit drug use, HealthDay reports. It’s well understood that illegal drugs can do serious damage to one’s teeth, but many dentists are asking such questions because they often prescribe prescription opioids. In fact, dentists are the second-largest group of prescribers for opioids. That being the case, it makes sense that dentists have a responsibility to screen for substance use disorders; however, only more than half of the dentists surveyed believe that it should be their responsibility. The findings come from a survey of more than 1,200 dentists nationwide which was conducted by researchers at Columbia University, according to the article. The findings were published in Addiction.